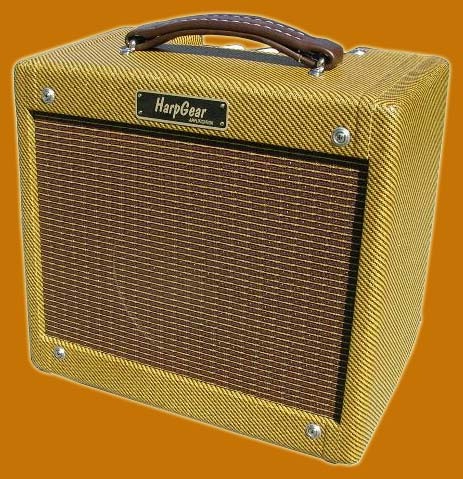 HarpGear.com the home of the best harmonica and harp amps! It was just a matter of time before we were asked to provide a more versatile amp that would allow you to go from clean and jazzy to a down and dirty blues sound. 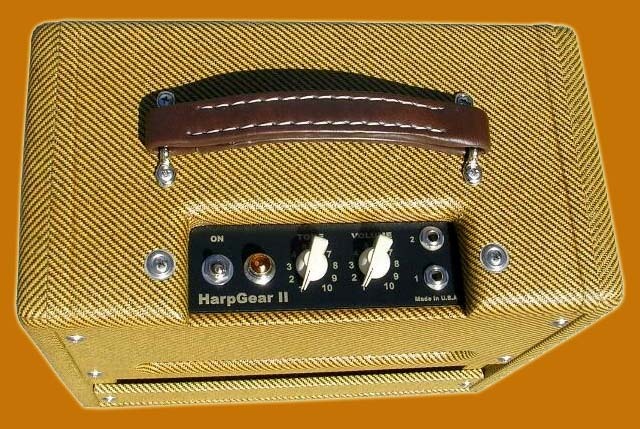 The HarpGear 2 is that amp with a tighter front end for more bass response and a punchier feel when you play. The tone control acts more like a high roll off allowing you to play with more highs when your session requires or allowing you to roll off the highs from the amp and get even more bass and distortion with less feedback. This amp has an oversized output transformer like the other amps and even more great bass to really accentuate those low notes while your playing. This amp also uses more filtering so it works really well with the line out as a quiet recording amp with great tone. The tube configuration for this amp is as follows: (1) 6V6GT power tube (1) 5Y3GT rectifier tube (1) 12AY7 preamp tube. This amp will generate between 5-7 watts of power which comes across surprisingly loud. This amp is 13"H X 14.5"W x 9"D and weighs 14lbs. 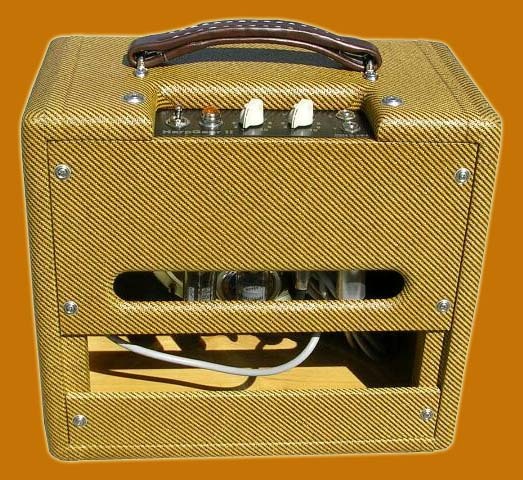 Players use this amp for small to medium gigs with great success with no assistance. This amp can easily be used for large venues by connecting the line out to the PA and you will get the same great tone the amp is known for as loud as you or the soundman would like. This allows you to use the amp as a monitor and the PA to get you heard over the rest of the band. Richard Sleigh playing the HarpGear 2 with guitar. Dennis Gruenling playing the HarpGear 2 with no effects. Dennis Gruenling playing the HarpGear 2 with a guitar player and no effects. -Solid pine finger jointed cabinet. -Solid 3/8" Baltic birch baffle for the best sound reproduction. The baffle acts just like the sound board on a guitar and unlike particle board baffles which absorb the tone the Baltic birch reproduces your tone accurately. -High quality transformers for a truly awesome sound as well as oversized transformers to add more honk to your amp and give you plenty of sweet round distortion. -Mil Spec G10 Garrolite eyelet boards to prevent both tweed disease and moisture absorption common on pressed fiber boards which produces false capacitance and causes crackle and hum. You will not have that problem with our boards and they will last a lifetime. -Highest quality components including Sprague Atoms capacitors, Xicon Capacitors, Sprague Orange Drop, IC or Mallory 150 tone caps, phenolic sockets, switchcraft jacks and custom transformers. -All amplifiers are hand wired one at a time with the utmost attention to detail. All component leads are straightened and cleaned before the are soldered to the G10 board. -Values of components are increased in key areas to make the amplifier more responsive with all the bass and crunch a harp player needs. -Weber VST speakers, Real Vintage and Jensen vintage speakers. -An additional line out jack to run to the PA so you will never have a problem being heard over the rest of the band. You can still use your amp as a monitor to hear yourself while plugged into the PA. The line out can also be used to record directly into your computer line in or into a sound board. Please feel free to contact me with any questions you may have.